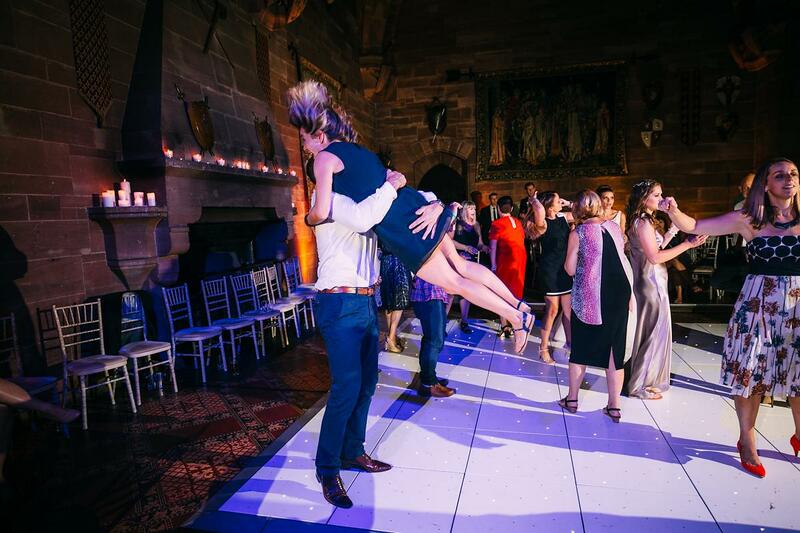 What I most remember about Aimee and Ian’s wedding at Peckforton Castle is the mad dance floor antics. Specifically Tina Turner and Rolling on A River! It was a great way to finish off the wedding day and summed up the day. It was SO much fun. Ian is the kind of guy who is up for anything and throws himself at any task wearing a smile. After the ceremony, photos, and speeches he hit the dance floor hard! At one point he picked up Aimee and twirled her around which made for some epic wedding photos. Aimee was charming and looked so beautiful in her dress from Love Bridal Boutique. Especially as she walked down the aisle. I think they are some of my favourite photos from the day. I really wasn’t sure what she’d wear but her dress suited her perfectly and also the venue Peckforton Castle. The guys got their suits from Special Day and Appletons which worked well against the formal backdrop. The wedding rings were from Philip James Jewellery in Bath. I don’t know whose idea it was to hire the Mr & Mrs signs that glowed in the dark but they were worth their weight photographically! They looked brilliant and I had to tell myself to stop taking photos of them at one point! I love them so much that I’ve even added a few to my wedding photography portfolio. Peckforton Castle is a really beautiful wedding venue. The flowers from White Orchid looked amazing in the ceremony room, and the ceremony room really stood out because of the beautiful light. Their wedding photos just look stunning and I can see why they chose it. I started off with Aimee and the girls in the morning. Natural Bride by Emma did an amazing job beautifying everyone and the house with the simple neutral tones made a beautiful background. My good colleague Jason helped me out all day and took some great images from the back of the ceremony! Credit where it’s due! The beautiful wedding cake from Bloomsbury Wedding Cakes looked great under the special lighting setup. I wasn’t sure about all of the lights and smoke that the Funtime Frankies had set up but it looked incredible! Your wedding was truly incredible, I can’t wait to see the album when it arrives. Wishing you both all the love and happiness for the future! great set buddy, last two frames are epic! What a stunning couple and venue!! New fan here! Great collection here! Beautiful photos 🙂 And that sign is awesome! Their romantic photos are just stunning too. From start to finish: love. it. all! You are a story telling genius!! I am always amazed. Oh my golly! What an amazing wedding at the Peckforton Castle! I love all the emotion you captured along with those portraits with the ferns! Awesome work Albert, love it ! Amazing collection of photos, you did a splendid job Albert! That cake cutting OCF is killer! Teach me plzzzzzz! Beautiful photos of two beautiful people. Wonderful memories. This is seriously a gorgeous wedding!